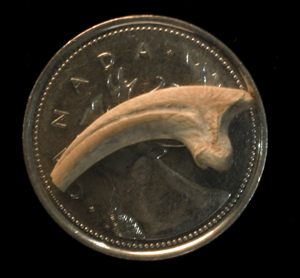 In a report published Monday in the Proceedings of the National Academy of Sciences, Canadian paleontologists have once again identified the fossil remains of what is believed to be the smallest nonavian dinosaur ever discovered in North America. The paper entitled “A microraptorine (Dinosauria–Dromaeosauridae) from the Late Cretaceous of North America,” co-authored by Nicholas R. Longrich of the University of Calgary and Philip J. Currie of the University of Alberta, describes a 1.9 kg dromeosaur, named Hesperonychus elizabethae. The previous record holder, also identified by Longrich and Currie was a chicken-sized insectivore named Albertonykus borealis. Hesperonychus elizabethae was named for the late paleontologist Betsy Hollis who in 1982 collected a significant Hesperonychus pelvis fossil from Alberta’s Dinosaur Provincial Park. The discovery of Hesperonychus is the first sign of small carnivorous dinosaurs in North America and also extends the timeframe of small, birdlike dromaeosaurs known as the Microraptorinae in the fossil record by approximately 45 million years. Specimens from China have been found dating to 120 million years ago, while Hesperonychus appeared to have thrived until the end of dinosaur age in the late Cretaceous. The paper is available behind a pay firewall, but a press release from the University of Calgary includes video.